"I can recall how five years ago when we started this foundation none of us knew exactly where this would all lead." 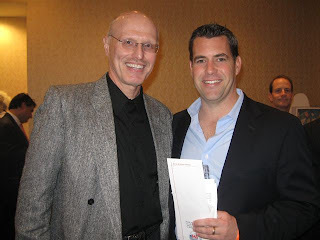 stated Keith Zimmerman. "And now, looking out at this packed ballroom and knowing all of you have come here in support of our cause is....well let me just say...how very, very grateful our entire family is." Ryan Zimmerman's father was on stage in the Virginia Beach Oceanfront Hilton Ballroom on Friday night, October 29th, addressing over 300 supporters, sponsors and volunteers. 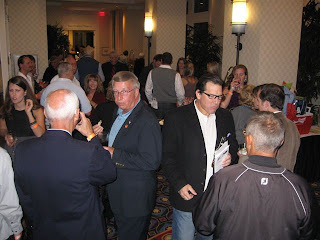 All of whom had posted up for the 5th ziMS Foundation Gala & Golf Tournament to help The Zimmerman Family in their quest to find a cure for Multiple Sclerosis. Dedicated to Ryan's Mom, Cheryl, who was diagnosed with MS in 1995, The ziMS Foundation's grassroots beginnings has now benefitted the Washington D.C. National MS Society Chapter, The University of Virginia Department of Neurology, The Hampton Roads MS Society and The Arlington YMCA to a tune of well over $500,000 in funding. This charity organization has become such a success, it has not only found a foothold, but is beginning to make a difference for those suffering from this dreaded disease. 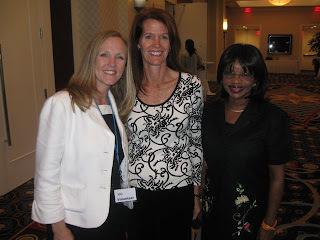 You may recall how this past August, 2010, the ziMS Foundation hosted their first Washington, D.C. area event: "A Night At The Park". 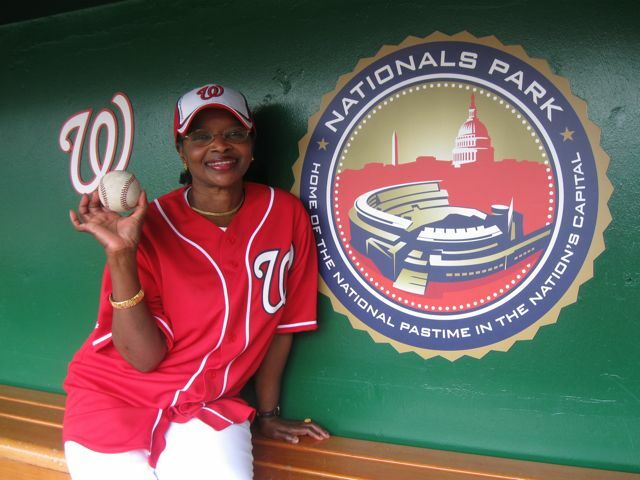 A Nationals Park fundraiser that brought in over $40,000 for charity. 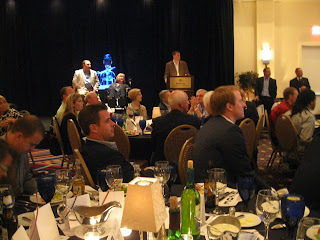 The largest single day philanthropic event in the charity's short history. But it's in Virginia Beach, Virginia (Ryan's hometown) where everything started. "My parent's drive this effort. Our friends and family do much of the footwork, but we couldn't do this without all of you," stated Ryan Zimmerman on Friday night before the assembled crowd at dinner. "We can't thank all of you enough for caring and giving up your weekend to spend some time with us. So please enjoy yourselves and let your friends know what a good time you had here tonight and tomorrow at the Golf Tournament." 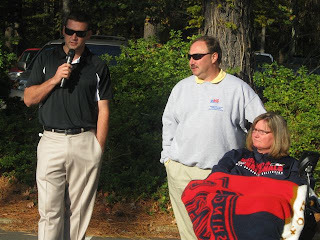 Ryan making this statement moments before the ziMS Foundation handed over a $150,000 donation check to The University Of Virginia Department of Neurology. 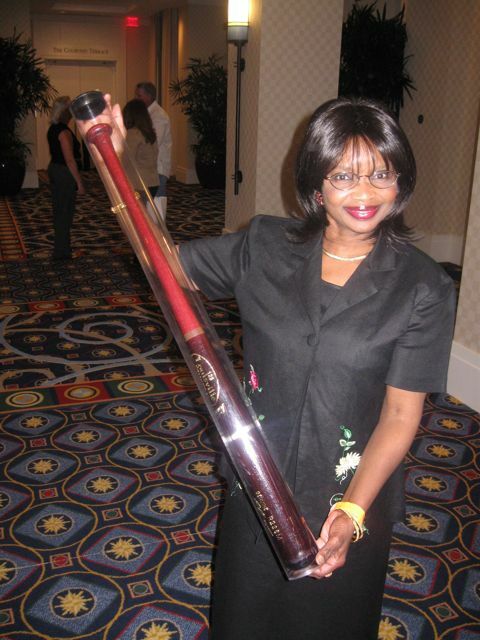 The largest gift ever given by the charity. 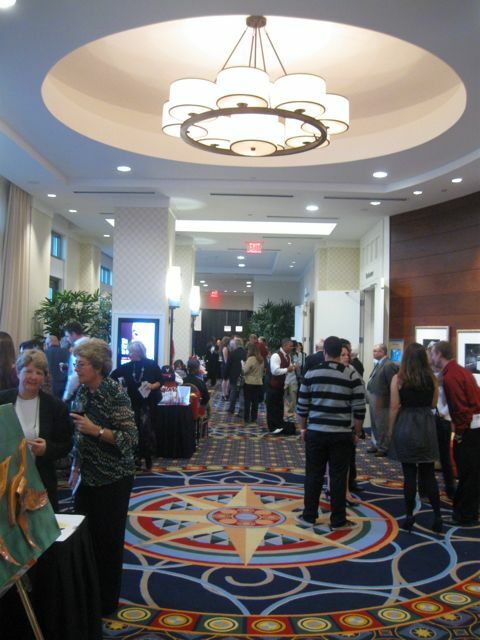 As usual, a VIP reception kicked off the two-day event on Friday night at 5PM. 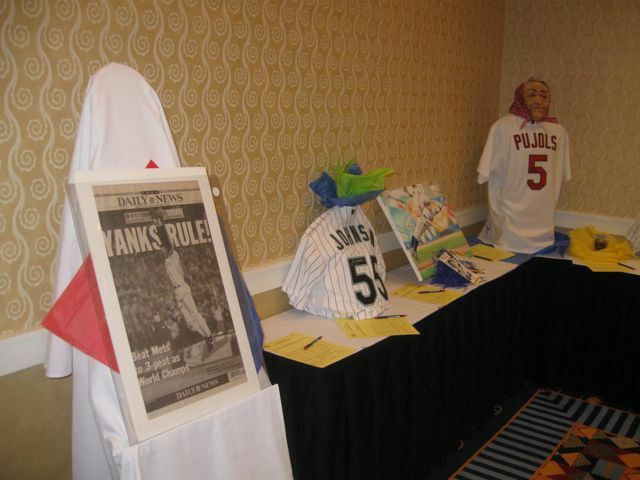 Sponsors and special guests were invited to meet with Ryan and take the first shots at bidding on the many silent auction items. Hor d'oevres and drinks were served as The Amazing Magic Dave performed his many tricks for the second year in a row and a string assemble provided the pre-dinner atmosphere music. Regular ticket holders joined the festivities beginning at 6PM. 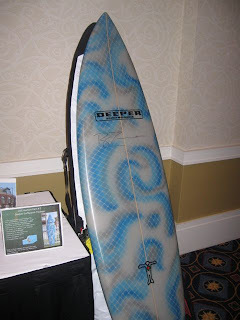 Once again, some of the silent auction goodies up for grabs were quite impressive. If you enjoy sports memorabilia, the signed jerseys available to bid on included those from Ryan Zimmerman, Stephen Strasburg, Joe Torre, Bobby Cox, Roy Halladay, Ryan Howard, Chase Utley and Albert Pujols among many, many others. Zimmy also made available his specially made, game used, Rawlings Gold Trimmed 3rd Baseman's Mitt. 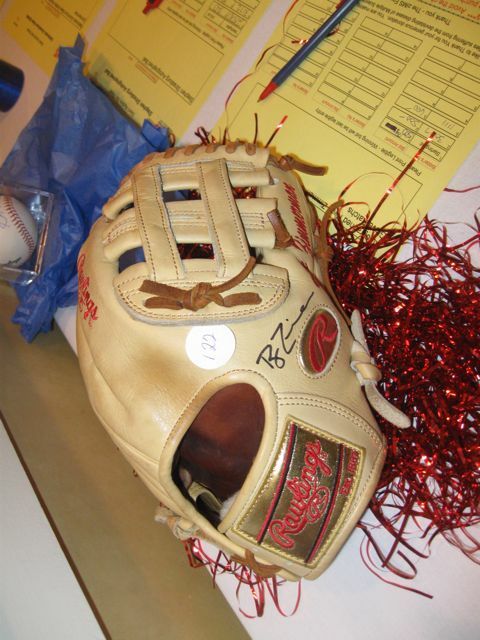 This one-off design by Rawlings is produced for reigning Gold Glove Winners each season. With the Gala happening in conjunction with Halloween weekend, many of the jerseys were adorned with Halloween masks. That glove though was downright beautiful. A Clay Walker signed BandAgainstMS.org guitar, HD Plasma Screens, vacations to Port St. Lucie, Florida and Nags Head, North Carolina, Bed & Breakfast stays, restaurant certificates, even gardening tools, rounded out the over 100 items up for bid. For the third straight year, the Live Auction included a specially made for the ziMS Foundation Ryan Zimmerman signed surfboard. 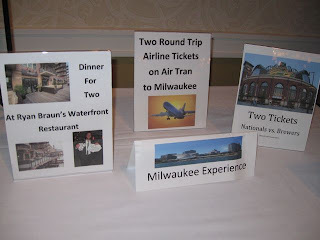 A weekend trip to The Atlantis Resort in The Bahamas, roundtrip airfare to Milwaukee, Wisconsin in 2011 to see Our Washington Nationals take on The Brewers. Included in this baseball package was dinner at Ryan Braun's Milwaukee based restaurant and a signed jersey from The Brew Crew's All-Star. The Washington Redskins donated game tickets to an upcoming Skins Home Game versus The Tampa Bay Buccaneers that included pre-game passes and signed memorabilia from Redskin players Chris Cooley and Trent Williams. 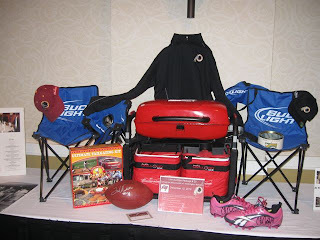 Attendees also could bid on a Fishing Trip and a Nationals Park Game Experience which included four tickets in Presidents Club, Parking, On-Field Batting Practice passes, signed Ryan Zimmerman memorabilia and a "Meet & Greet" with Washington's Franchise Player. The African Queen & I were fortunate enough to take home a personally autographed Ivan "Pudge" Rodriguez Washington Nationals engraved baseball bat. We were in the running for Zimmy's Glove until the final call, but got beat out at the buzzer--sadly. After dinner was served, Hotcakes, a well known Tidewater area dance band, provided music for everyone wishing to dance the night away until the 11PM close. 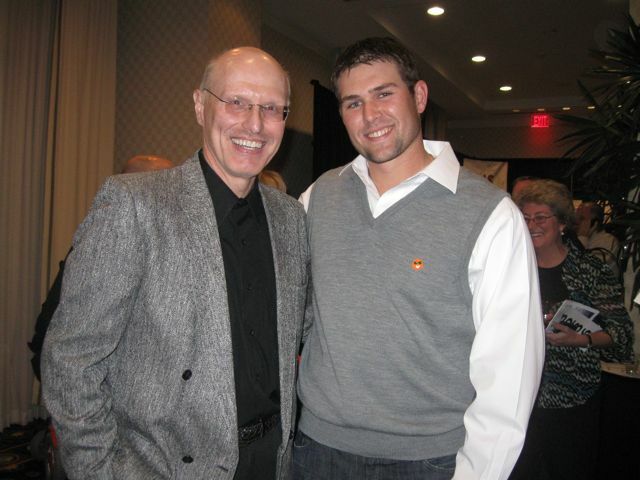 Players in attendance for the Gala included former National and now Pittsburgh Pirate--Joel Hanrahan, and Ryan Zimmerman's Washington teammates: Tyler Clippard, Craig Stammen and John Lannan. 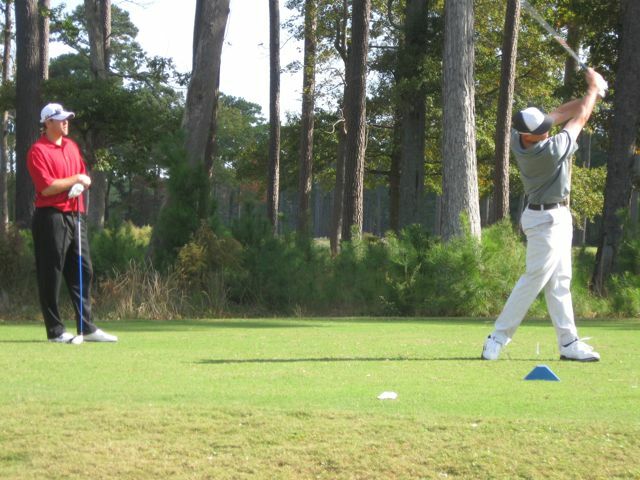 Nats Hitting Instructor Rick Eckstein joined the festivities on Saturday for The Golf Tournament--as did Tidewater area native, and New York Met All-Star, David Wright. 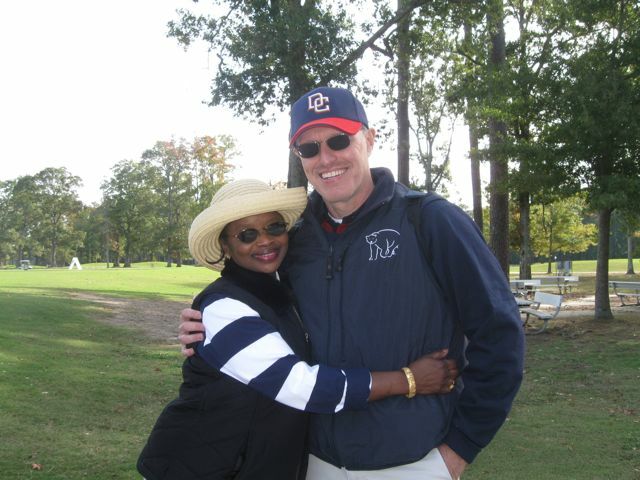 Once again, Sohna and I were happy to participate in the Gala--as well as The Golf Tournament on Saturday. In fact, the highlight of the entire weekend for us occurred at Red Wing Lake Golf Course where one of those moments just happen that you come to cherish for a long, long time. 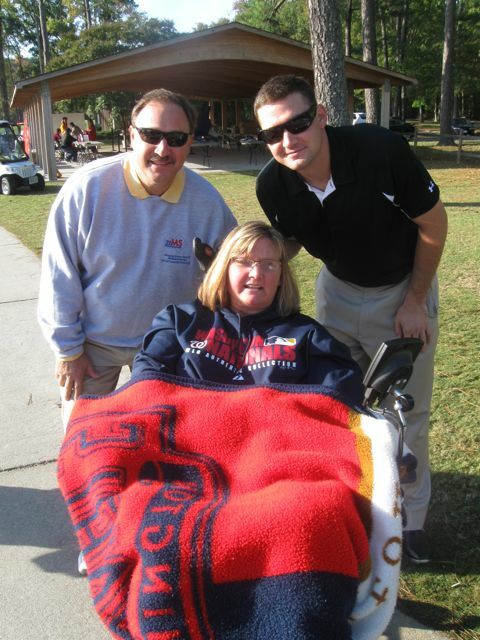 More on that moment and the ziMS Foundation's Golf Tournament coming tomorrow on Nats320. 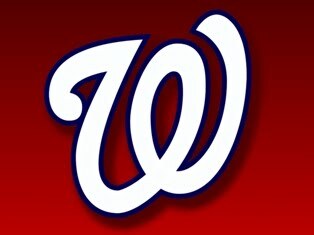 Sohna and I haven't had much time for baseball and Our Washington Nationals since the 2010 regular season ended. We've been on the move working various assignments--long hours that have taken up much, if not all, of our free time. Although as we put up this post, The African Queen and I are leaving Virginia Beach, Virginia after attending the 5th ziMS Foundation Gala & Golf Tournament. 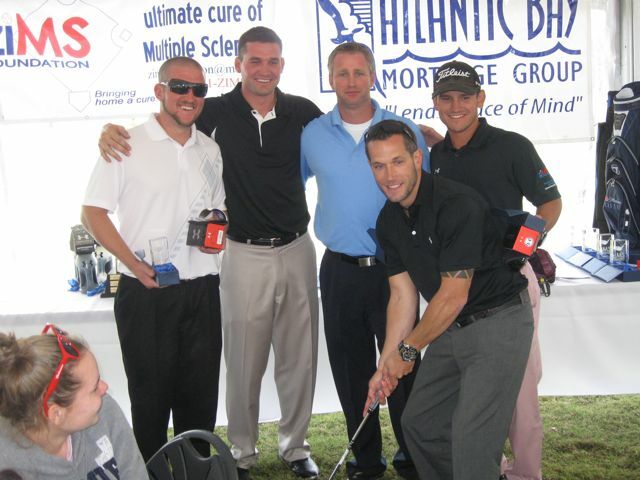 We planned everything this month around Ryan Zimmerman's annual charity event for Multiple Sclerosis. There was no way we were going to miss it. It's just too much fun for a good cause. A complete recap and story coming. And thanks for the many comments asking if we were OK. We appreciated the thoughts. "Every year it gets better and it’s something I look forward to every year," stated Ryan Zimmerman. "Not only because we, obviously, raise money and are doing good things, but it is a really, really fun event. Everyone that comes has a great time. And I think that is more important than anything else." 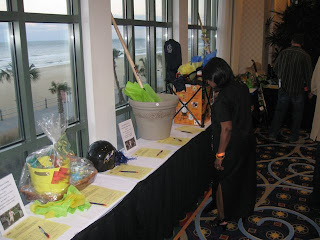 Our Washington Nationals star 3rd Baseman was talking about the ziMS Foundation's annual Gala & Golf Tournament held since 2006 in Virginia Beach, Virginia. 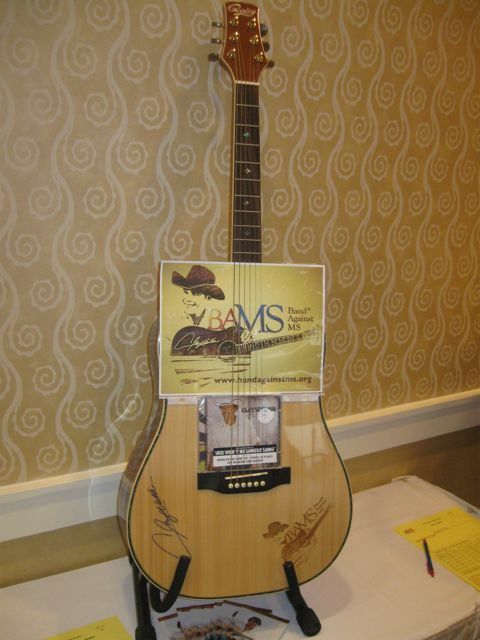 Now in its 5th year, The ziMS Foundation's annual fundraiser in the Z-Man's hometown will take place again the weekend of October 29 and 30th, 2010. 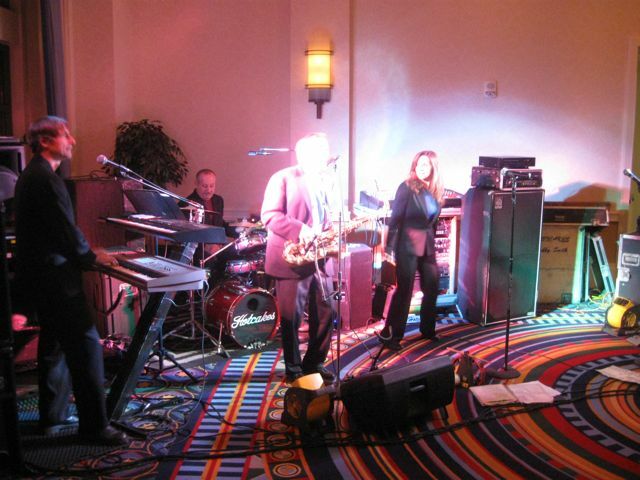 Not only will the Friday night Gala feature hors d'oeuvres, silent and live auctions and dinner, but Hotcakes (The Number 1 Dance Band on the East Coast--according to the band's website) will be on hand at The Virginia Beach Oceanfront Hilton to provide entertainment. 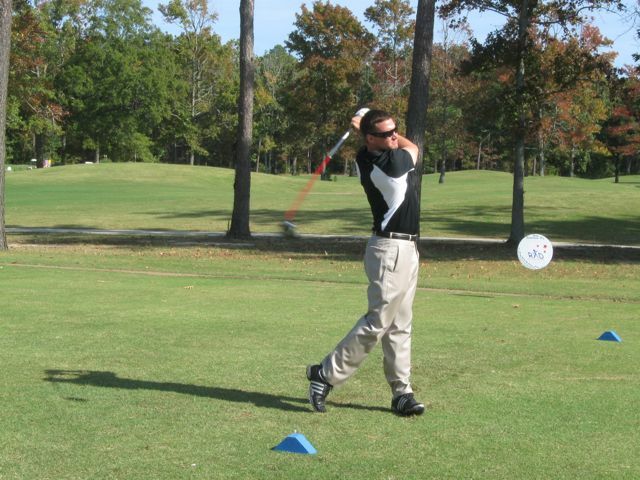 The Golf Tournament will take place the next morning at the nearby Red Wing Lake Golf Course. "It’s obviously exciting for us," continued Ryan. "We’ve come a long way. We’ve raised money and done some good things, but getting the word out has been more important. 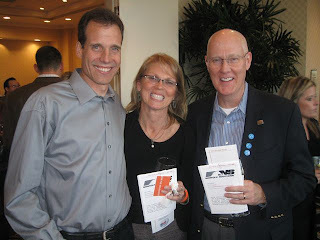 We’ve raised the awareness about multiple sclerosis and that’s what it’s all about." As many may already know, Ryan's mom, Cheryl has MS. 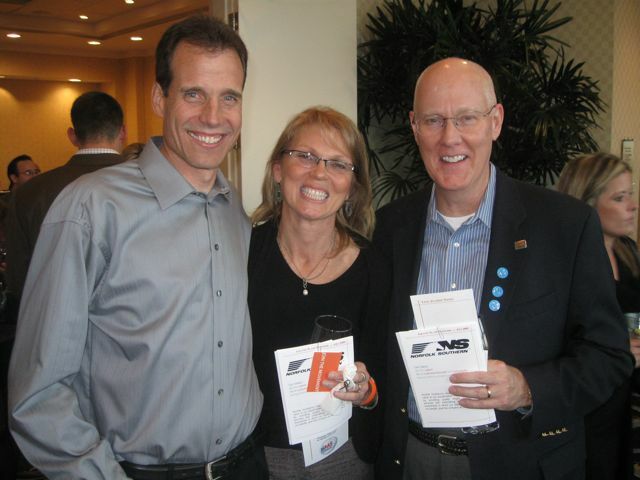 Through their efforts, the ziMS Foundation has raised the profile of this dreaded disease that effects the central nervous system. This past August, Nationals Park was even the venue for the ziMS Foundation's premiere event in the Nation's Capital. Since its inception, Ryan along with his family and friends, has raised over $500,000. 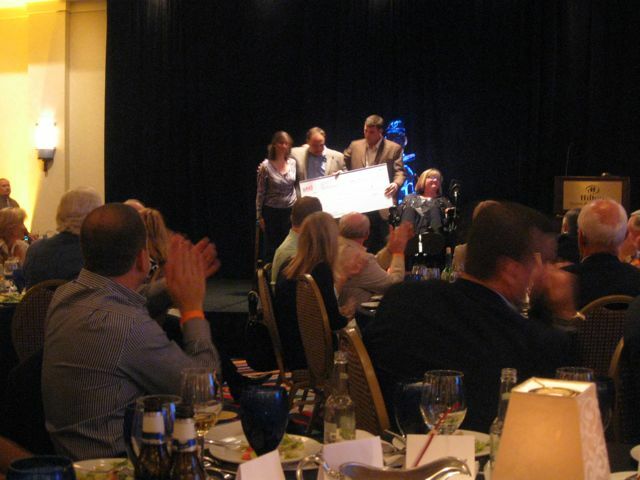 Looking to make a difference in the lives of those suffering from MS, the foundation has handed out numerous grants. 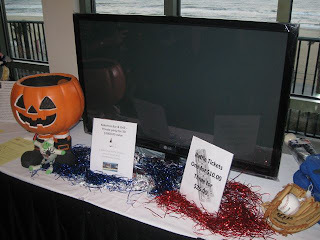 Tickets to the October 29th Gala are $75. 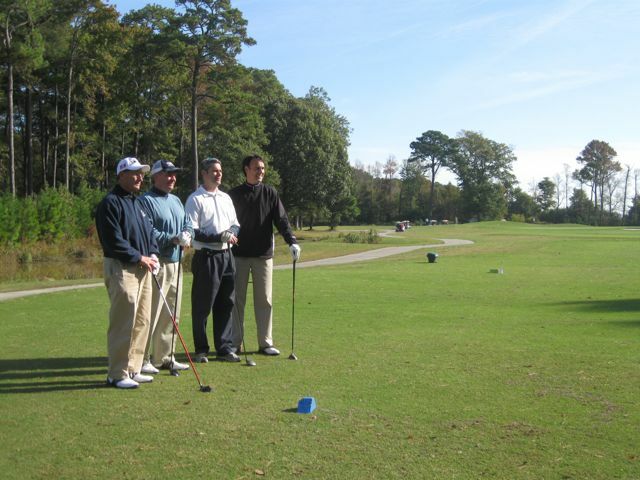 Space is limited for the Golf Tournament where the cost for foursomes begin at $1500. The Virginia Beach Oceanfront Hilton is the host hotel for this special weekend. And the ziMS Foundation has negotiated a special rate with the Hilton for those wishing to stay overnight. 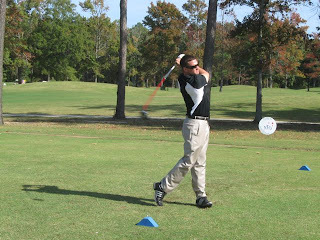 Major League players that have competed in the golf tournament over the past few years include: Brian Schneider, David Wright, Michael Cuddyer, John Lannan, Craig Stammen & Joel Hanrahan. 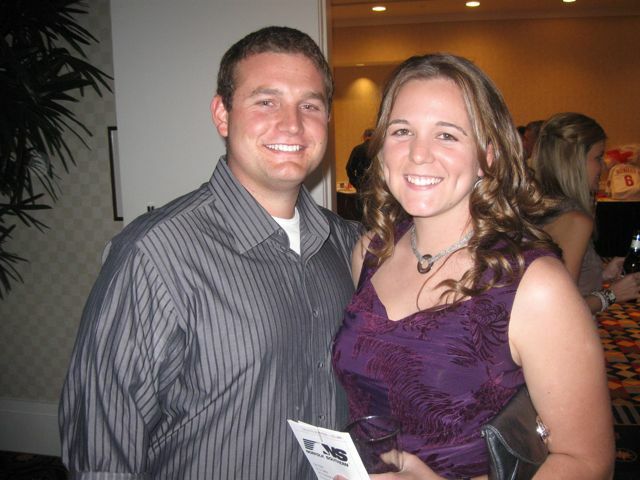 Ryan Zimmerman: "I am very lucky to have some good friends in the game that come out, take time out of their off-season to support my cause. A lot of them are going to be in the playoffs (this year). 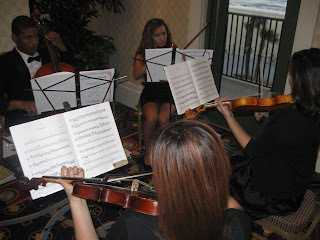 But they’ve all said, if they are not playing--and we hope they go far--they will be here to support us again. That's all I can ask." Tickets to the Gala can be ordered here. Golf foursomes and sponsorships here. Virginia Beach Oceanfront Hilton room reservations here. 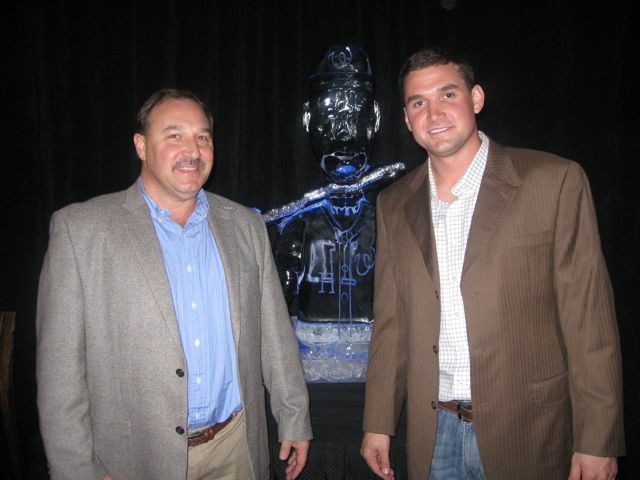 "When we started the ziMS Foundation, we had no idea what we were getting into," concluded Ryan Zimmerman. "Now to be able to host events at home and in D.C.--something that can get very big when it comes to using the stadium--it’s all very gratifying. D.C. has become my home and it’s great to come out and do things in that city as well as in Virginia Beach." Every season has its ups and downs, highs and lows. Memories that will never be forgotten and those that you wish you could, but can't get out of your mind. The just completed 2010 year for Our Washington Nationals was no different. 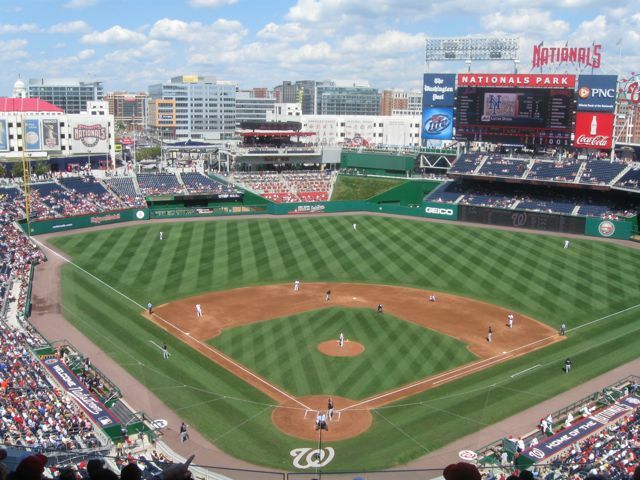 Today, on the final day of the 2010 regular season, D.C.'s Team went long distance again to complete the schedule for the second year in a row. After going 15 innings at Atlanta to defeat The Braves to conclude 2009, Washington went 14 marathon innings--with both teams emptying their benches early--to garner Curly "W" Number 69 of 2010. Jim Riggleman's team claiming 10 more victories than last season--scoring their final run of 2010 on a bases loaded walk allowed to Justin Maxwell by Oliver Perez plating Adam Kennedy. Final score from Citi Field in Queens, Our Washington Nationals 2 and The New York Mets 1. While Our Washington Nationals were playing this seemingly never ending game against The Mets, Sohna and I spent the entire afternoon watching the game on MASN and listening to Charlie Slowes & Dave Jageler on WFED 1500AM broadcasting the game (as we always do) while reminiscing about the past six months of Major League Baseball in the Nation's Capital. There was plenty for us to talk about. We came up with this list of our most memorable moments of the year--both good and bad--for the 2010 Version of Our Washington Nationals. We are sure there are a few others, but these stood out the most. Without a doubt, the best highlight of the year was Stephen Strasburg's Major League Debut against The Pittsburgh Pirates on June 8th. The Frenzy speaks for itself. Nationals Park had never been so loud. Never had virtually the entire in-stadium crowd been all Nats Fans. That night was special--no question about it. Ryan Zimmerman's walk-off home run on July 31st wasn't bad either. The passion showed through on The Z-Man's 12th walk off hit of his still young career. Dependable in the clutch like no one else in Nationals history, Zimmy also hit a walk off home run against The San Diego Padres on June 6th at Nationals Park. One day before Adam Dunn socked out three home runs in one game against The Friars for the first time in his career. 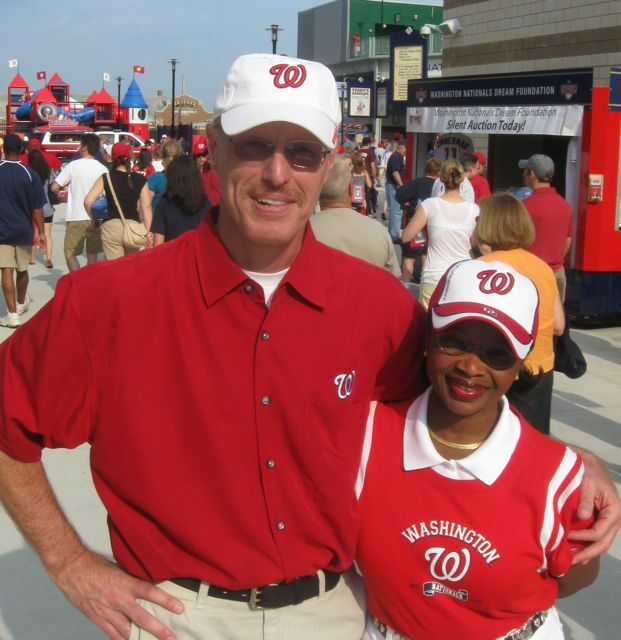 Opening Day, 2010, at Nationals Park was one of the low-points. All our energy was zapped after Philly Fans took over the ballpark, booed Ryan Zimmerman receiving his Gold Glove & Silver Slugger Awards and then trounced Washington 11-1 in a total wipeout. Not as bad, but just as hard to watch, was then witnessing the entire home schedule go full circle when The Phillies clinched the National League East Title on South Capitol Street last week. Nyjer Morgan made the defensive blunder of the year when he threw his glove down to the ground in disgust over missing a baseball off the bat of Baltimore's Adam Jones in May on South Capitol Street. A baseball he thought went out of the park, but hadn't. The result: an inside the park home run for Jones that left Nationals Park booing with disgust. Compare that mental error to what happened one month later at Camden Yards, when Nyjer made, without a doubt, the finest defensive play this season for Washington. Climbing the right centerfield wall--and nearly going over--Morgan hauled in a certain home run off the bat of The Orioles' Corey Patterson. Patterson so impressed with the effort, he doffed his batting helmet in complements. Nyjer Morgan was also directly involved in The Melee in Miami. 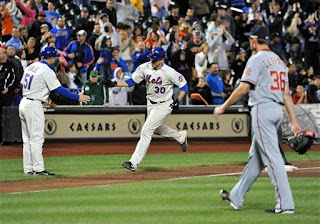 "The Mets Must Hate" Willie Harris saved Matt Capps and his Washington teammates from certain defeat at Citi Field in April when he dove to his right, rushing in, to catch what was certain to be the game winning hit by Rod Barajas. There was also Ryan Zimmerman's Immaculate Reception, Ian Desmond's acrobatic pick and throw out of Dexter Fowler of The Colorado Rockies, and numerous defensive gems in just one month's time in the Big Leagues by Rookie Danny Espinosa. Roger Bernadina wasn't bad himself defensively. And finally showed some power. 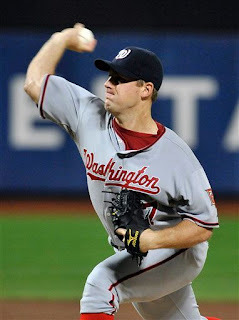 Speaking of Matt Capps, he performed like an All-Star, was named Washington's only participant in this year's Mid-Summer Classic and then was sent packing to The Minnesota Twins for the very impressive and young catcher--Wilson Ramos. Livan Hernandez brought the magic back to D.C. Baseball with a complete game shutout of The Milwaukee Brewers in April. 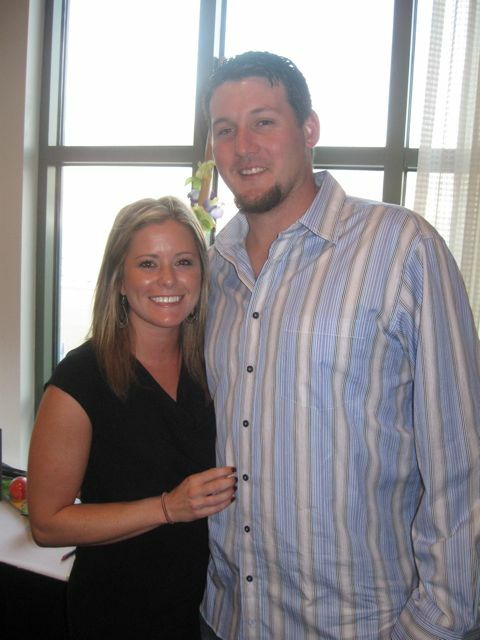 One day later, Jason Marquis couldn't make it out of the 1st inning against The Brew Crew at Nationals Park. A frame in which Our Washington Nationals were down 10-0 before they had even batted once. Being swept by The Orioles, at Camden Yards, when Baltimore was the worst team in baseball at the time (record wise)--was hard to swallow. In each game, Washington had the lead, but lost each of the three games played. Compare that to D.C.'s Team winning The Battle Of The Beltways Series on South Capitol Street when Josh Willingham crushed out a walk-off home run on a pitch thrown by Cla Meredith. Stephen Strasburg couldn't get loose on July 27th against The Atlanta Braves. Miguel Batista made the emergency start, pitched well enough to get the win, then became an instant Nationwide Celebrity when after the game he stated he understood why fans booed him when announced as the starter: "Imagine if you go to see Miss Universe, then you end up having Miss Iowa, you might get those kind of boos," Batista said. Miss Iowa, Katherine Connors, never received so much publicity representing her state. So much so, Batista sent her flowers before Ms. Connors was flown to Washington to meet Batista in person and even throw out the first pitch at Nationals Park before a media-packed game. Unfortunately, Our Number 37 not making the start that day may well have been the sign of things to come. 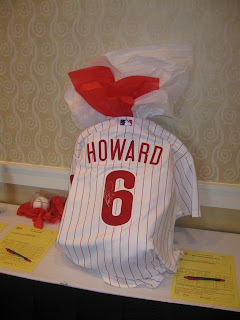 A few weeks later, the entire baseball world watched in horror as Stephen Strasburg would go down for the season with Tommy John ligament replacement surgery on his right elbow after throwing a pitch at Citizens Bank Park against Domonic Brown of The Philies. The balloon went out of Washington's season that night. The momentum killed. And the games were never quite the same for the remainder of 2010. Interestingly, the announcement of Strasburg's season ending surgery was made one day after Our Washington Nationals officially welcomed the number one overall pick in the 2010 draft, Bryce Harper, to town in a much anticipated press conference and impressive batting practice session before Nats Staffers at Nationals Park. And Jordan Zimmermann returned 51 weeks after Tommy John surgery and by the end of September showed signs of a near complete recovery. Danny Espinosa's home debut at Nationals Park against The Mets--two home runs, six rbi's. Despite his 30 plus errors, Ian Desmond came to play every single day and finished the 2010 season with some good numbers at the plate. Combining with Espinosa in the middle infield, "Despinosa" as Charlie & Dave call Washington's new 2nd base/shortstop duo--may well be the defensive wizards in Washington's uniforms fans have yearned for. The Chicago Cubs' Marlon Byrd made his visionless journey at Wrigley Field on April 28th on a Luis Atilano fly ball that was lost in the sun. "Mikey Mo" showed he belongs in a big league uniform. 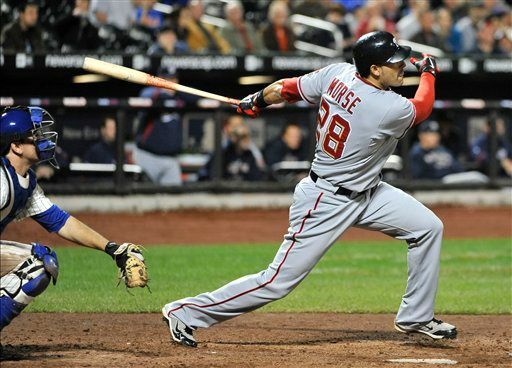 Michael Morse pounded out 15 home runs in limited starting roles for Washington, adjusted with the league and was rarely overmatched. The St.Louis Cardinals and Our Washington Nationals played one of those special games in late August. A 13-inning affair where every position player was used by both managers and pitchers had to pinch hit for other pitchers. As a baseball fan, you had to love that one. Willie Harris slapped a drive off Atlanta's Kyle Farnsworth to right center at Nationals Park in late September. A drive which The Braves' Nate McLouth could not catch off the wall. Seeing the baseball bounding back toward left field, Harris never stopped running, ran out of gas, but didn't give up and slid face first home to record the first (second home run--Austin Kearns do so in 2007) Inside-The-Park Home Run in Nationals history. And there was "Superman"--The Florida Marlins' Rookie Sensation Mike Stanton--launching his majestic home run off Joel Peralta at Nationals Park on August 12th that NEARLY reached the Center Field Plaza walkway. What a shot!! That ball had lift-off and if it had not bounced off the handicapped section protective railing at the rear of Section 106--would have found concrete first. Cristian Guzman was traded to The Texas Rangers in late July. The only Nationals Player to be on the Major League Roster for every single season since baseball returned to The Nation's Capital. 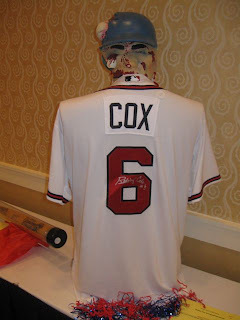 Yeah, he missed an entire season due to injury, but he was still on the Big League roster disabled list. 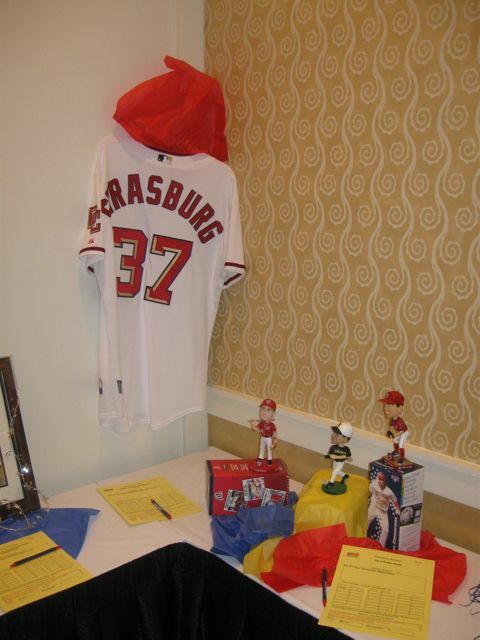 The Washington Nationals Dream Foundation's D.C. Baseball Academy land transfer finally took place--moving the Ft. Dupont Park baseball outreach program closer to reality. 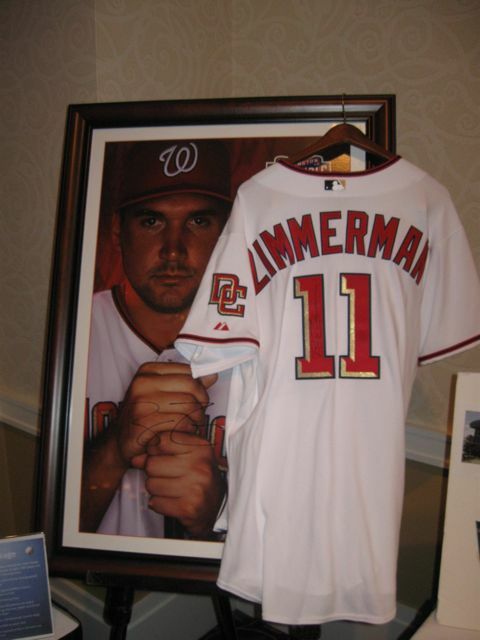 Ryan Zimmerman's ziMS Foundation premiered an event in D.C. with a lavish gig at Nationals Park on August 9th. 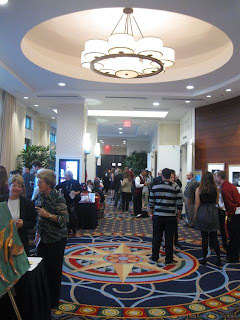 Dedicated to finding a cure for Multiple Sclerosis, the ziMS Foundation hopes this Washington event will get bigger and better in each successive year. And finally, there was this huge news story when Team President Stan Kasten resigned after five years on the job. 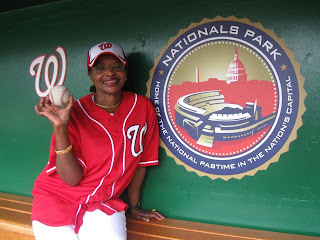 The public point person for all baseball decisions surrounding Our Washington Nationals since The Lerner Family took control of the team in mid-2006. Mr. Kasten says he is not retiring. But his loss will be missed throughout the entire organization--no doubt about it. Those are our most memorable moments of 2010 which Sohna and I came up with this afternoon while watching Our Washington Nationals finish the season with 69 Curly "W's" and 93 losses by going deep into extra innings for the 2nd year in a row--this time to defeat The Mets 2-1. P.S. 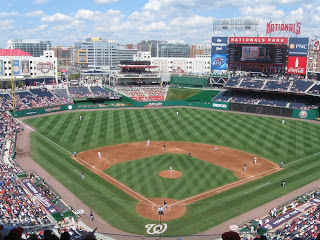 And for the third season in a row at Nationals Park, Sohna was in attendance for every inning of every game played at the South Capitol Street Ballpark. Pat Misch should not be striking out 10 batters in any Major League game, not even against Our Washington Nationals. When the difference between a pitcher's fastball, changeup and slider is mostly just one mile per hour in either direction--that pitcher should be hit, not whiffed at all night long. Yet, D.C.'s Team managed to do so this evening at Citi Field in one of the strangest outings all season by an opposing pitcher. For eight innings. The New York Mets' Pat Misch mesmerized Washington's hitters on slop, and nothing but slop. 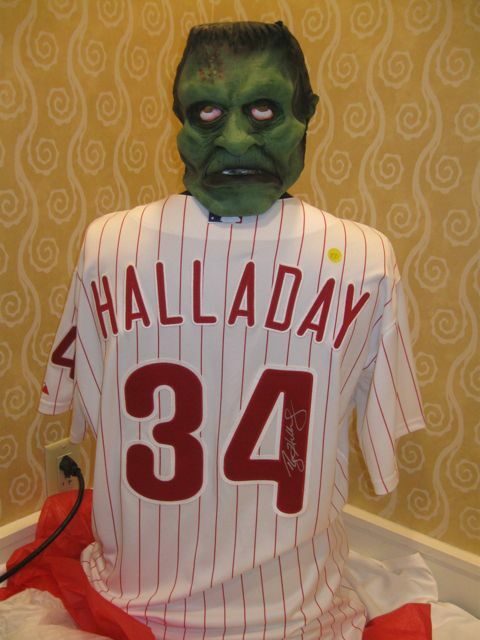 28 batters in Nationals Uniforms faced him and only four reached base. One scored, and that was on a solo home run poked to right center by Michael Morse in the top of the 7th when "Mikey Mo" got ahead in the count and patiently waited for a pitch to drive for his 14th home run of the season. A stance few others on his team considered this evening as pitch after pitch after pitch was thrown by Misch that landed in the dirt with two strikes. Yet, more times than not, Washington's hitters swung at it anyway and got themselves out. Too bad, because Jordan Zimmermann concluded his 2010 recovery season from Tommy John Surgery with an outstanding final appearance: six strong innings thrown--only a solo home run allowed to the possible National League Rookie of The Year Candidate--Ike Davis--ruined his day. Otherwise, J-Z was rock solid. The "Z With 2 NN's" giving up just three hits, that one score, while walking zero. He wasn't involved in the final decision, but clearly, Baseball Management has made the decision that after a few more months rests leading up to Spring Training, 2011--Jordan Zimmermann may well be all the way back from his August, 2009 surgery. A good sign and promising too. Not only for Zimmermann but for his contemporary, and teammate, Stephen Strasburg--going through the same procedure and recovery process right now. 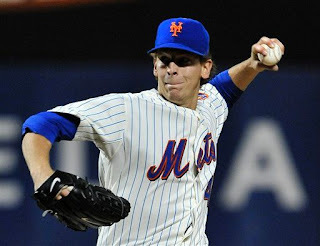 Tyler Clippard was foiled in his effort to complete 18 straight scoreless by allowing the game winning home run in the bottom of the 10th inning to Josh Thole, but Clippard's 7th loss of the season (against 11 wins) was not the real story. The headlines will say Pat Misch struck out 10 and Jordan Zimmerman continued his speedy recovery from elbow replacement surgery. But the bottom line was that Our Washington Nationals kept getting themselves out. They never gave themselves the proper chances to reach base in a close game. Everyone was looking to hit the ball out of the park, when small ball would have succeeded just fine. Final Score from Citi Field where journeyman lefty Pat Misch threw the greatest game of his professional life: The New York Mets 2 and Our Washington Nationals 1. Loss Number 92 put D.C.'s team in the position of having to win their final two games of 2010 to claim 70 victories. A difficult task now after watching Washington gather just 11 hits total over the last four games. You gotta play to win, but you also have to score runs too. Jordan Zimmermann and Washington's bullpen gave their teammates every chance to claim the Curly "W" tonight in a regulation nine-inning game. Unfortunately, most of Our Washington Nationals hitters just kept getting themselves out for 10. P.S.--Defensively, Washington hasn't lost a step at third base with Alberto Gonzalez manning the hot corner. He's a terrific fielder and possesses a fabulous arm. But when it comes to offense, what a huge difference compared to Ryan Zimmerman. Our Number 12 struck out three times tonight and for the month of September/October is batting just .139 (six for 43). Incredibly, Alberto Gonzalez may reach 180 official At-Bats in 2010--yet only has four rbi's so far. The average Major League player gets 12 rbi's per 100 at-bats. Gonzalez is close to reaching a record low for rbi's and total at-bats in one season. An absolutely stunning statistic.